Author: Günther Schlee, Karaba Sahado. Series edited by: Wilhelm J.G. Möhlig. 4 pp. Roman, 192 pp. The Rendille are pastoral nomads inhabiting a wide area in the arid north of Kenya, east of the Ndoto mountain range and lake Turkana and west of Marsabit. Their language is closely related to Somali. In collaboration with Karaba Sahado, a Rendille singer and poet, more than 1,000 proverbs and sayings were gathered for the present study. Sahado occasionally uses proverbs himself in his songs and therefore shares the author’s interest in documenting and analysing this genre of oral literature. 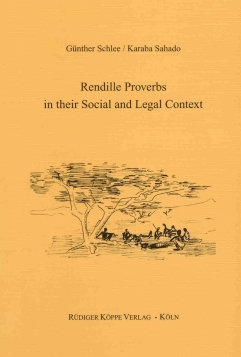 Because of the linguistic differences between Rendille and European languages it was deemed necessary to provide linguistic as well as ethnographical explanations to elucidate the meaning of the Rendille proverbs. To this end the proverbs are subjected first to a morphological analysis, then the morphemes are translated interlinearly and finally an English translation is given. If these measures were deemed insufficient to render the proverb’s meaning sufficiently clear, a further note explaining the proverb’s content was added. Sometimes longer excursions were necessary because the life-style of the Rendille is rather different from the perspective of western culture. An example are the elaborate marriage rules. Anecdotes and fables are included to provide the reader with further background infromation on the history and oral literature of the Rendille. If possible the situational context where and when the individual proverbs are used is indicated. Especially in the context of legal disputes the appropriate use of proverbs, good rhetoric and the adroit referral to norm and wisdom are highly important in the absence of a body of codified law.